Dedicated to move the needle by supporting entrepreneurs & investors in increasing their impact on climate & poverty reduction. We are honored to work with amazing individuals and organizations in making this happen. A decade of experience in supporting entrepreneurs in emerging economies, of which five years focus on climate related business models including climate resilient food security, circulair economy models, lowering greenhouse gas emissions, climate-resilient water supply and sanitation, ICT as enabler to scale and all impacting on poverty reduction. We connect, empower entrepreneurs, investors, capacity-builders, and policy makers in a powerful way. The team has provided extreme added value to our desk as well as to co-funding partners in supporting our funding decisions with gap analysis, screening of enterprise and entrepreneur, with focus on capability for accelerated scaling. Aqua for All focuses on increasing access to water and sanitation for the poor. € 20 mln AUM. We support with deal sourcing, screening, portfolio management and development. Represent A4A in board meetings of the ventures. Advice A4A to use funding as catalytic first loss to attract more funders in this sector. Developed strategic partnership with leading funders in water kiosk business model. Manage multiclient research (Dalberg) to bring water kiosk sector to next level. UNESCO-IHE VIA Water program (€ 10 mln AUM) focusses on improving urban water issues. We doubled the pipeline of the fund in the first year in just 6 weeks by organizing an accelerator and tapping into our networks (summer 2015). This is a high risk fund aiming at increasing the number of urban water related innovations. We currently support a selection of the ventures to get ready to scale. The Smart Water for Agriculture Program in Kenya is a € 6 mln, 4 year program aiming at increased water productivity in agriculture and increased income and food security through the development of a dynamic and sustainable ‘Smart Water Solutions’ (SWS) sector in Kenya, adequately serving small and medium-sized entrepreneurial (SME) farmers. The target is to increase water productivity by 20% for 20,000 SME farmers (at least 50% women), for them to have secured water access for production and become more resilient to climate change. We support in deal sourcing, selection and will run 2 accelerators (pioneers + scale up proven technologies) in 2017 and 2018. 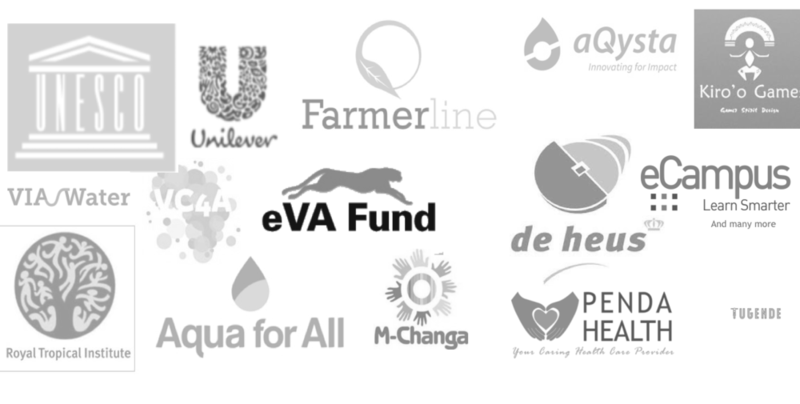 Program partners: SNV, Aqua for All, MetaMeta, Practica and KIT Tropical institute. Funded by the Dutch Embassy in Kenya.